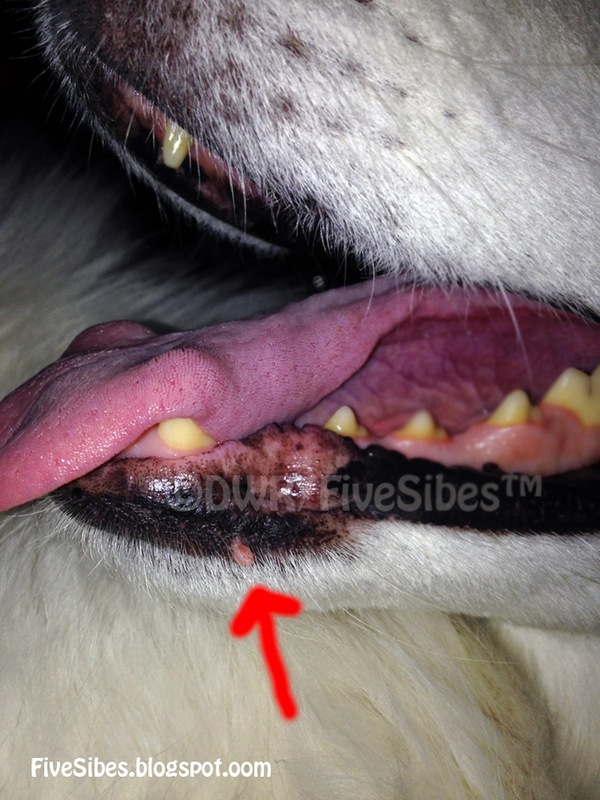 Lumps, Bumps & Growths: Are They Normal? Maybe. But, Always Have Them Checked. 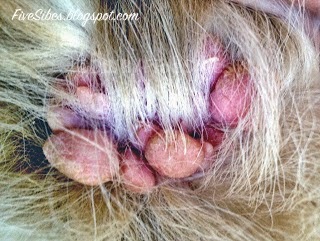 After a couple recent scares, I wanted to discuss lumps, bumps, and growths on a dog's skin. 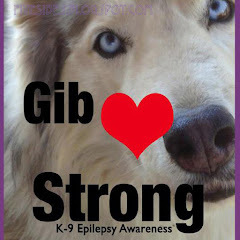 Recently, both Gibson and Wolf have required attention for growths. 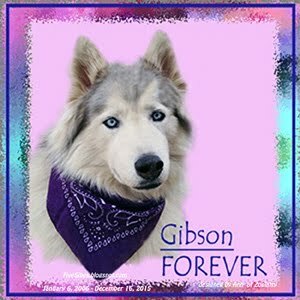 Gibson has had one on his right knee for almost two years. It started off as a simple skin tag. Normal color. Nothing alarming, other than I don't like bumps on my furbabies. Skin tag turned weird growth. 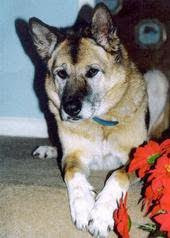 But knowing dogs, like humans, can get these "tags" as they get older. 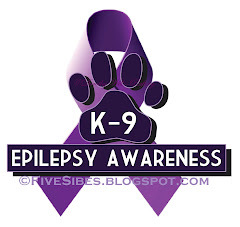 I constantly monitored it and had my vet team monitor it, and we covered it when he received laser treatments. (Laser treatments are amazing for healing wounds, arthritis, etc., but not for growths because while it works on a cellular level and is just amazing for healing, the flip side is it can stimulate growths, tumors, etc. to grow. 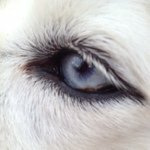 It's always important to discuss and review your dog's case with your vet prior to starting or continuing laser treatments, and always mention any growths or tags you discover on your dog's body prior to laser sessions). We were status quo for the better part of the past two years, only growing a tiny bit in size. Then a few months back, I noticed it had taken another jump in size and went from being the size of pin head to that of a pencil eraser. Then, as you can see from the above photo, the shape changed. It started spreading out and had rough spots. And then this past month, it started changing color. 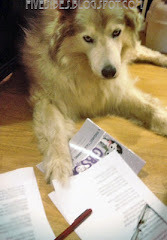 Fearing a melanoma, Gibson's primary vet recommended we remove it. 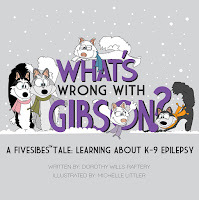 Naturally, with Gibson being an Epi-dog, any time surgery is required, options need to be reviewed and discussed as to the best course of action. 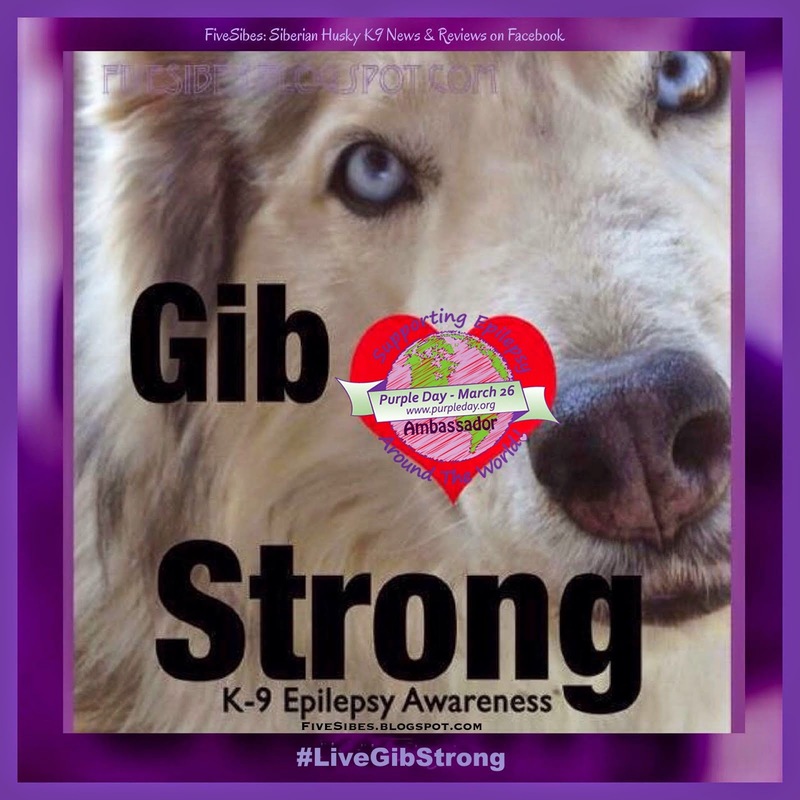 In Gibson's case, he was administered a local anesthesia on an outpatient basis, and the growth and a portion of the area around it was removed. 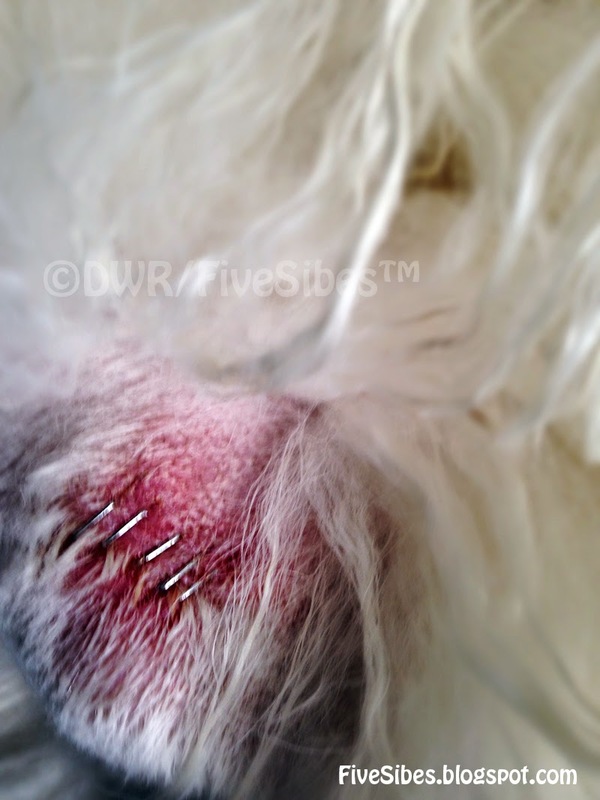 He received five staples and the growth was sent off for review. He also had a full blood panel drawn. I was present for the entire procedure, right next to one of his favorite vet techs, and I was able to pet my boy and keep him calm. Funny thing, he was amazing and actually the reversed happened...he actually kept me calm! While I was petting him during the surgical procedure, I discovered another small bump. At first I thought it was possibly a tick, but since the vet team was literally right over him, it's another skin tag, but nothing to be concerned about. 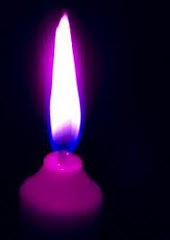 We will keep a watch on it, and hope it never grows or changes shape or color. 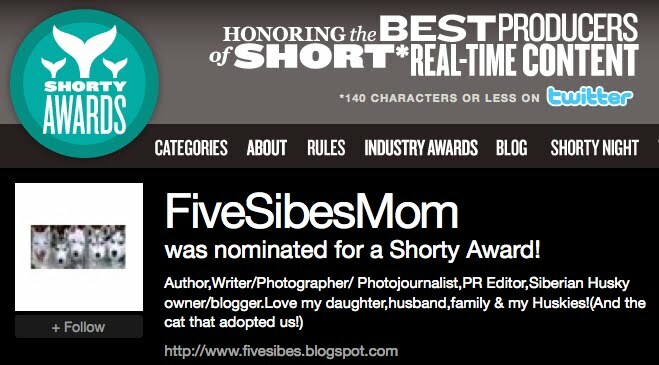 I held off writing about this until after the results came back in so I could give the full story. I'll jump right to the great news that the growth - a "nevus" - and the surrounding area is clear and benign! 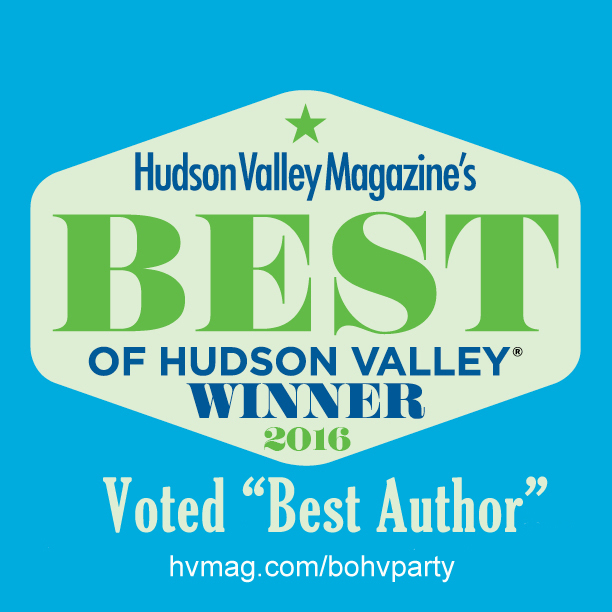 Wooo-hooo! biopsy results came back in? Hell, yes! 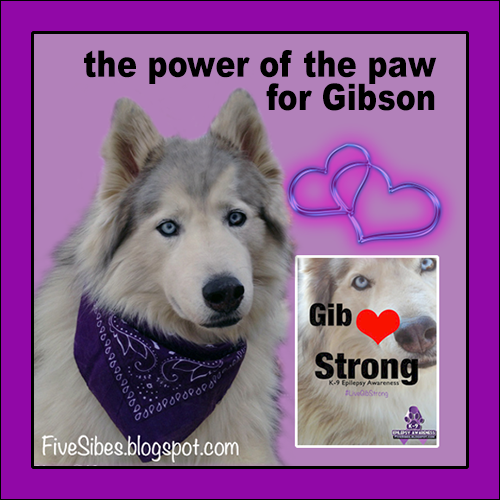 Gibson's surgical area is healing nicely and he's already received a laser treatment to help heal the wound site. 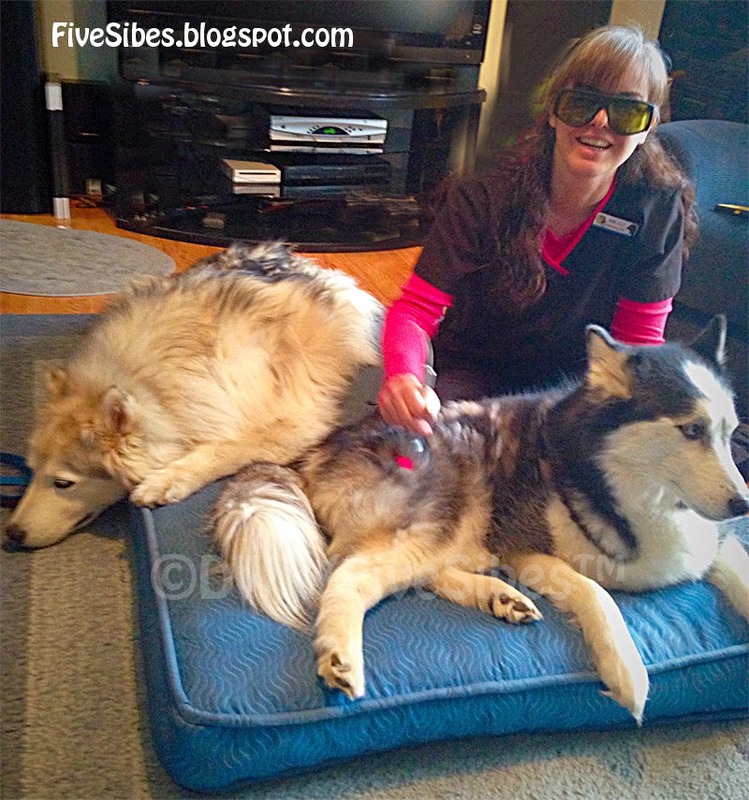 The really cool part is that now we no longer have to cover the spot for laser, and Gibson and Harley get "couples (laser) therapy" sessions together! As you can see, they are quite cozy sharing a bed and their fondness for one of their favorite vet techs, June! We no longer have to wonder and worry what the growth is or what it could be. What a relief! Honestly, knowing that growth is gone has removed a huge weight off my shoulders and mind. 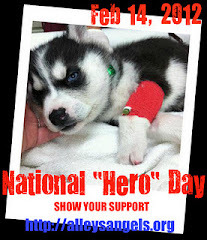 I'm so thankful it's clear, and truly thankful I have such a wonderful and caring vet team! Just a month earlier, we had another little scare. I noticed a funky little spot on Wolf's lip. Upon close inspection, it appeared to be a simple little skin tag. Normally not something that's much of a worry, but any growths of any kind should always be pointed out to the vet and watched for any type of change. 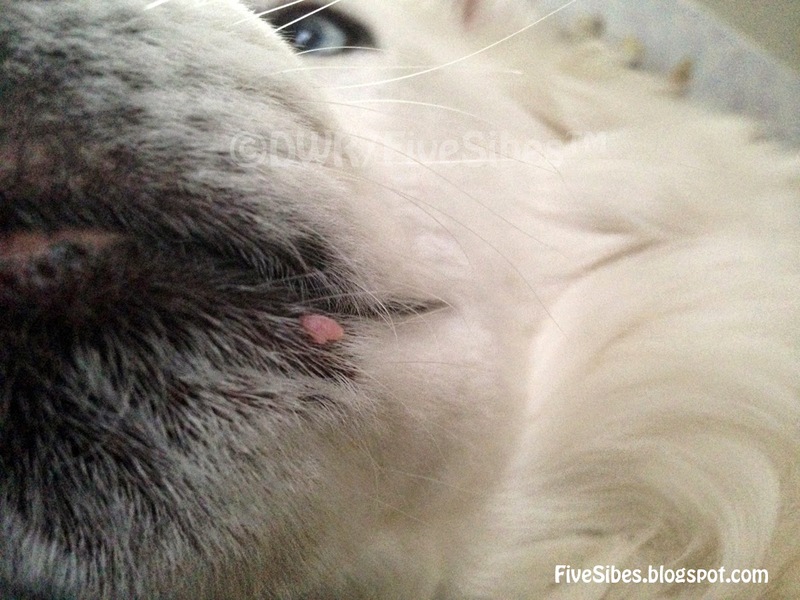 papilloma that quickly turned into a small, then larger cluster or "cauliflower head" type of growth. No lump underneath could be felt. It was just very weird. I consulted with our vet, and we decided to have it removed. What was lurking under the skin. When the vet opened up his leg (and imagine this - it was on the knee, so not much room to hide a growth), there was a shocking large growth that was the size and shape of a "baby's foot," as the vet had noted. The "toes" were that cluster of growths seen on the outside of his leg, while underneath harbored the mystery growth that could not be felt on the outside. (Click HERE for the full story). Talk about shocked and stunned - and even my vet said in all of his years he never saw anything like it. Thankfully, it too, turned out to be benign. So seeing another growth on him set off all kinds of bells and whistles. Thankfully, this was an easy one and it's now off! 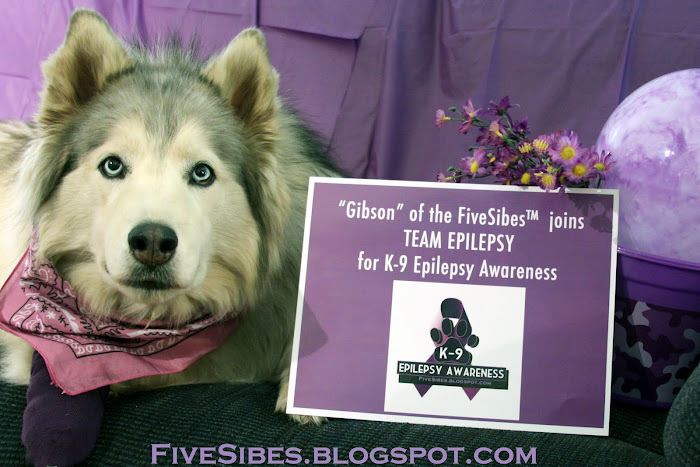 Gibson: "Woo! Glad that's over!" 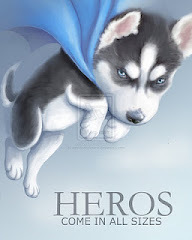 Wolf: "Woo! Me too, big brother." My message here is this: If you see a lump, bump, or growth of any kind (yes, it's scary, but try not to assume the worst), please do have it checked out. As with anything, early detection is a good thing. 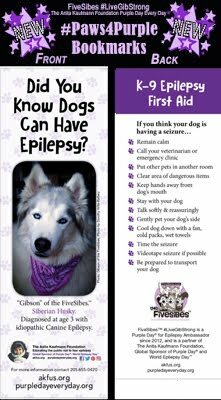 We never know how it may turn out, but the sooner these types of things are looked, and followed up on with your vet, the better. Sometimes small little bumps are just normal skin tags, nothing different from what we get...but sometimes they could be the start of something else. Being proactive can make a difference. 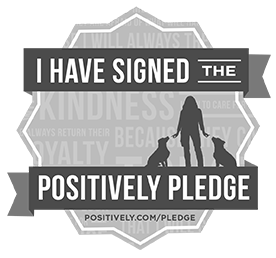 At the very least, being proactive can certainly prove to be a great piece of mind. Talk about being so very thankful...oh, and there was a whole lot of hugging going on...and still is! 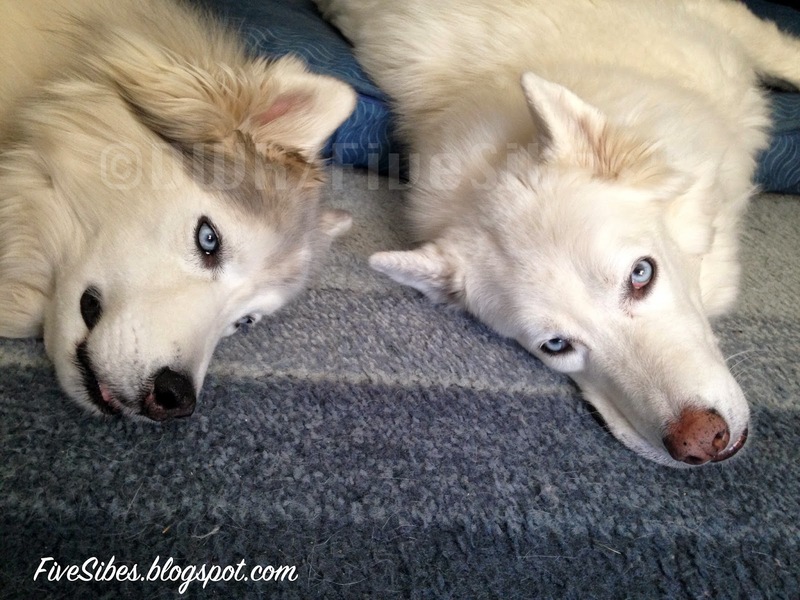 Chilling Out on a Wordless Wednesday! 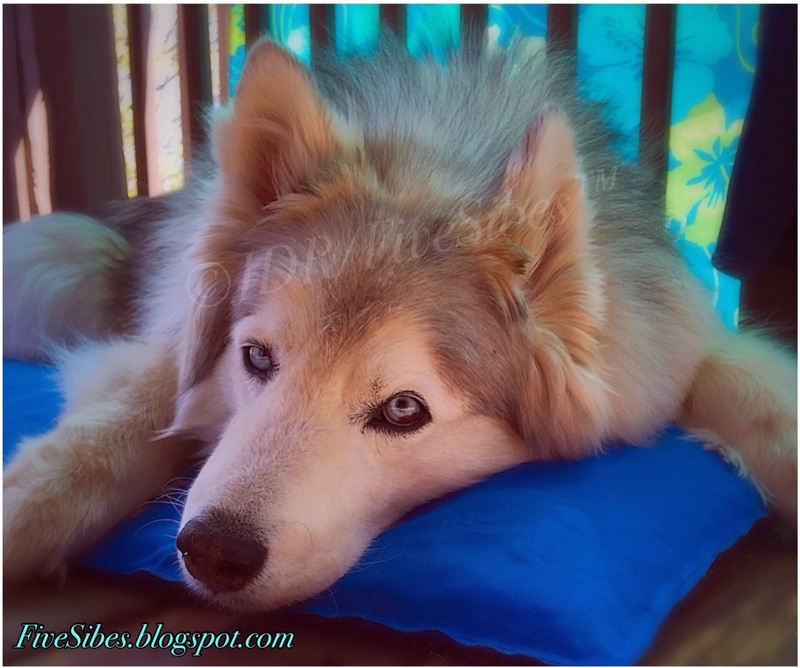 Gibson loves his cooler bed & outdoor deck "Husky cabana!" 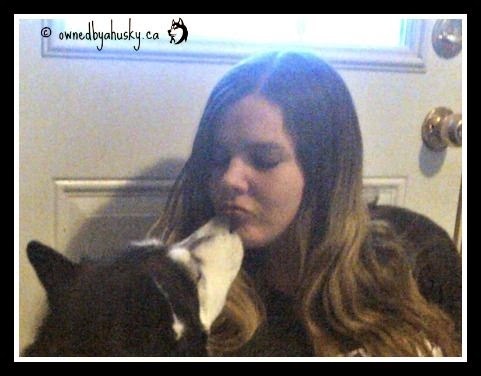 Today's great meme is this (p)awesome pic by Jordyn Kerr of her two beautiful dogs Mika the Husky and Epi-dog, Chloe, who are best friends! 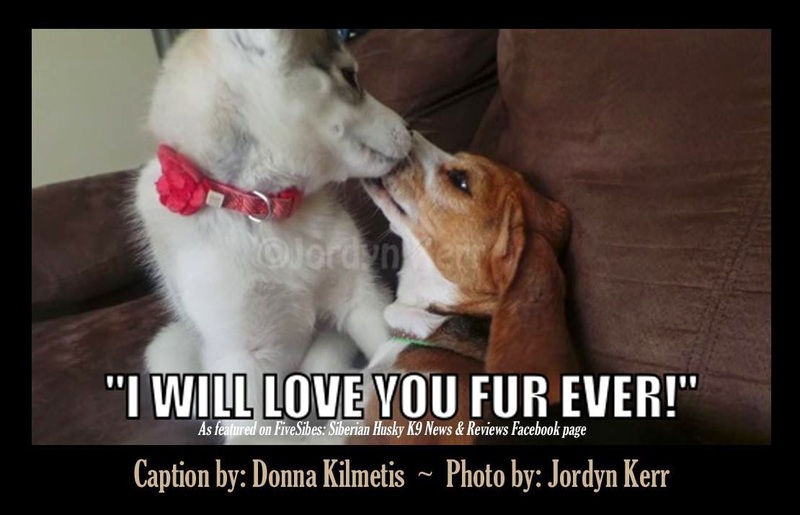 The perfect winning caption is by Donna Kilmetis of Husky Tales. 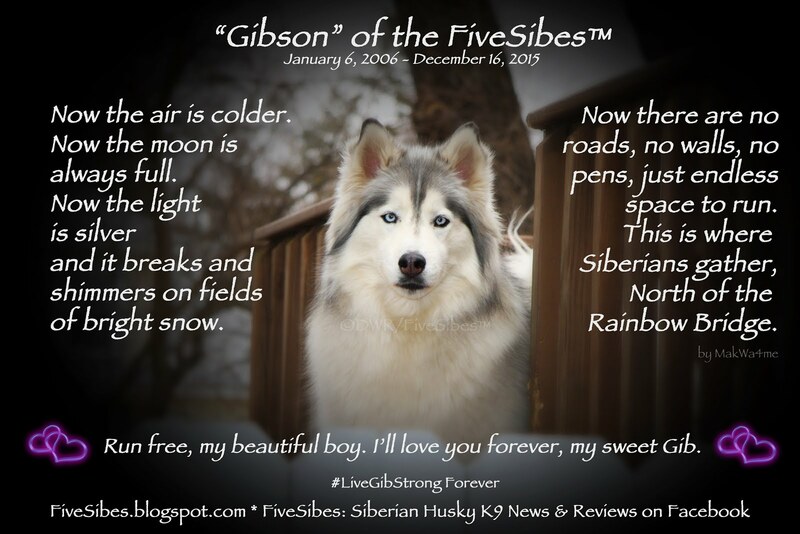 Our FiveSibes™ Merry Meme Caption Contest is periodically hosted over on our FiveSibes: Siberian Husky K9 News & Reviews Facebook page featuring gorgeous Siberian Huskies and clever memes suggested by and voted by on our readers. Mondays have you down? 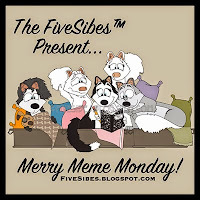 Come join us each week for some Merry Memes and lots of smiles! 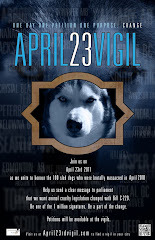 Would you like to see your Husky or northern breed featured in a meme? 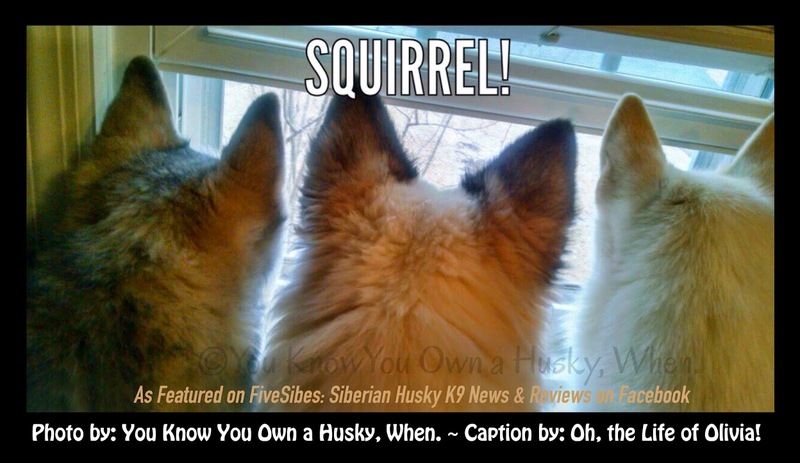 Post your pic on our Facebook page or Email it to us at FiveSibesHuskyNews(at)gmail(dot)com and put "Meme Caption Contest" in subject line! We'll post it on our page and the caption suggestion with the most likes, wins, and we turn it into a poster crediting both photographer and caption winner! 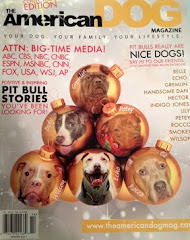 Lots of fun and a great way to highlight our furbabies! We hope you'll join us! 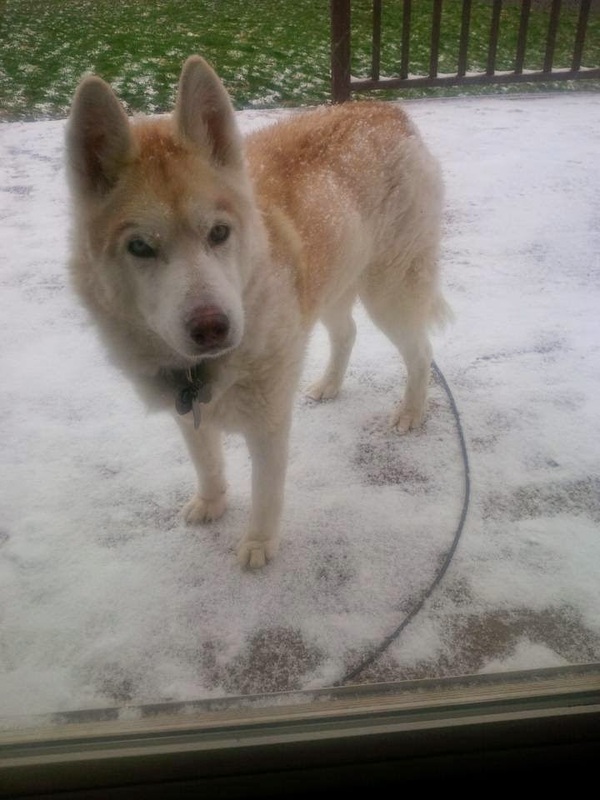 Sadly, we bid a safe final journey to our sweet furpal, "Nala" of Holly and the Huskies blog. 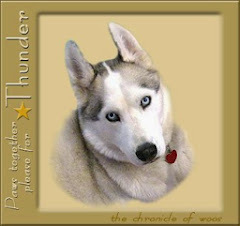 Holly is a close friend of mine and sweet Nala was the alpha queen of her pack family. Nala, who just celebrated her 14th birthday in true Disney "Frozen" style, has been fighting cancer as a true warrior princess, but she took a turn for the worse this past week and earned her silver harness and joined her furangel siblings Oreo and Timber. 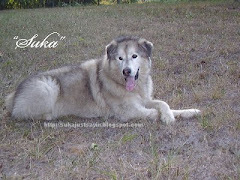 Run free, beautiful girl, you will remain in the hearts of those who love you always. 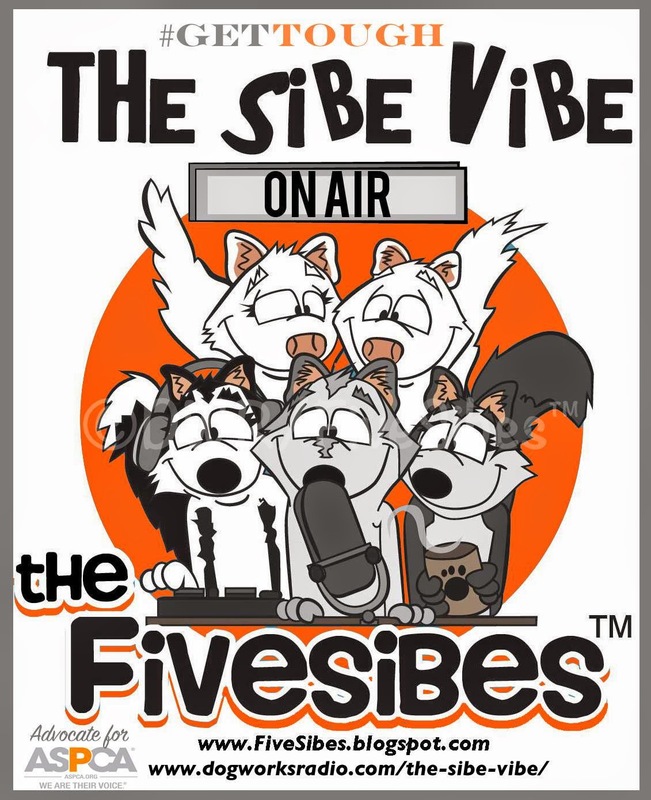 Today's ‪‎FiveSibes‬ ‪"‎The Sibe Vibe"‬ on Dog Works Radio features ASPCA Senior Manager of Social Media OLIVIA MELIKHOV. 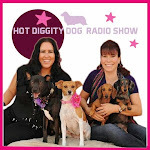 A very informative show where we discussed their ‪#‎GetTough‬ Dog Fighting Awareness campaign (see our earlier post HERE), how social media is a valuable tool, their mobile app that helps to post lost and missing pets, and prevention tips on keeping our dogs safe. Listen below! 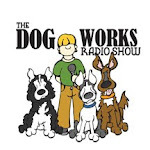 And remember, all of my "The Sibe Vibe" shows are available on iTunes under the Dog Works Radio show listings! Feeling Fit and Fine on a Flashback Friday! 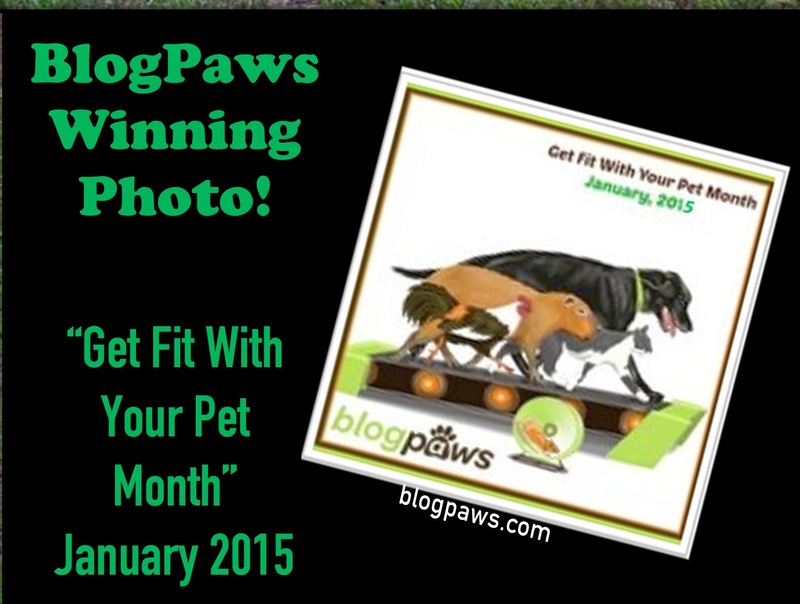 We were so thrilled to have won first place in the BlogPaws "Get Fit With Your Pet Month" back in January, so I thought this would be perfect for our Flashback Friday! 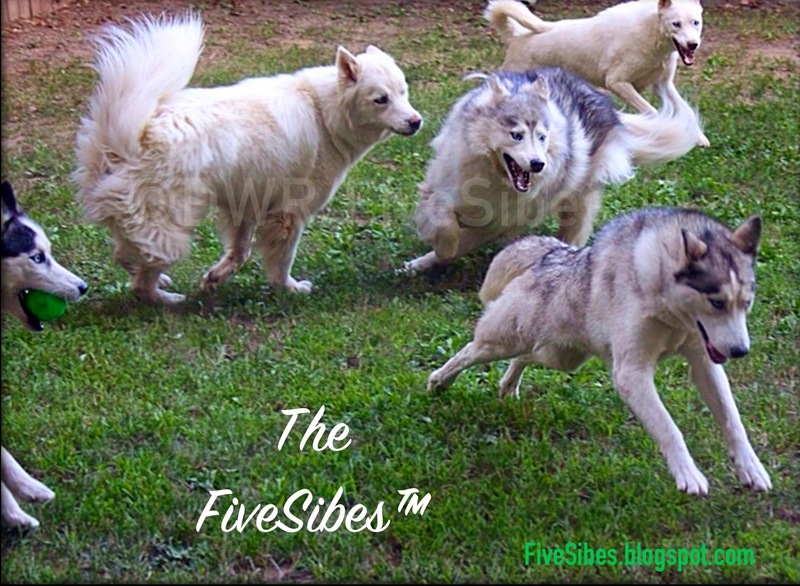 This is one of my favorite photos I've taken of my FiveSibes having fun in the back yard playing their version of Husky Ball! 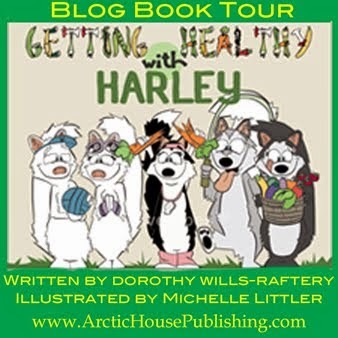 (Note the tennis ball in Harley's mouth to the far left!) 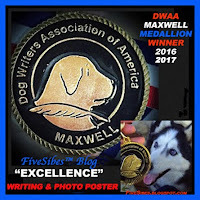 So naturally, I was very proud and pleased it was selected as the first place photo in the BlogPaws Photo Contest! 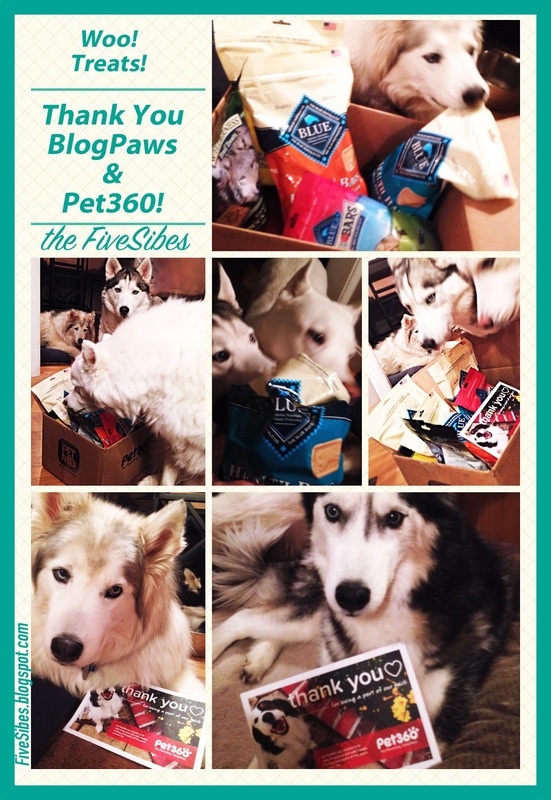 As a result of my photo being chosen - I received a fantastic $75 gift certificate from Pet360 for which we selected a case of the FiveSibes fave dog food and treats from Blue Buffalo! When the box arrived, they excitedly sniffed it and knew full well it was for them! 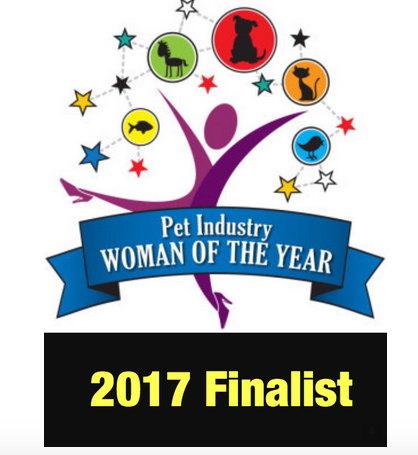 Thanks so much to BlogPaws and Pet 360! Today is also our co-host's birthday! 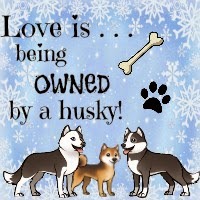 So please join us here at the FiveSibes in sending out warm wishes and woos and Husky hugs to Jenna over at Love is Being Owned By a Husky for a Siber-ific day! 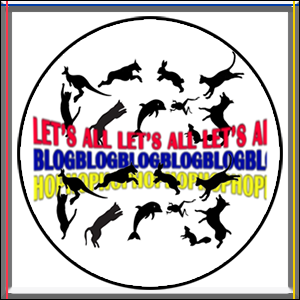 We do hope you'll share a pic of your pet from yesteryear and join in our weekly blog hop! 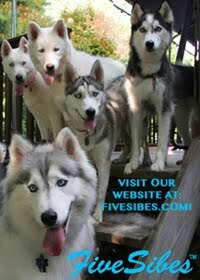 Flashback Fridays are brought to you by us - the FiveSibes - and our new co-hosts, Love is being owned by a Husky, each Friday. 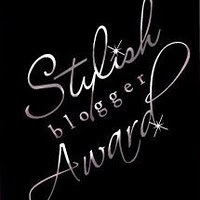 We hope you'll find a photo or video from your Memory Lane, post it, and link up to our blog hop each week! If you don't catch it on Friday, you can link up any time during the week! 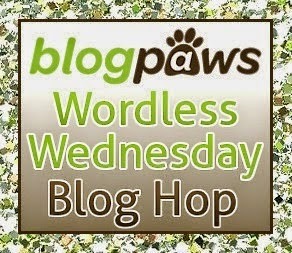 We are going "wordy" for today's Wordless Wednesday as we are sharing in the Earth Day celebration! This year marks 45 years of the Earth Day Network caring and promoting for the care of our Earth - everyone's backyard. 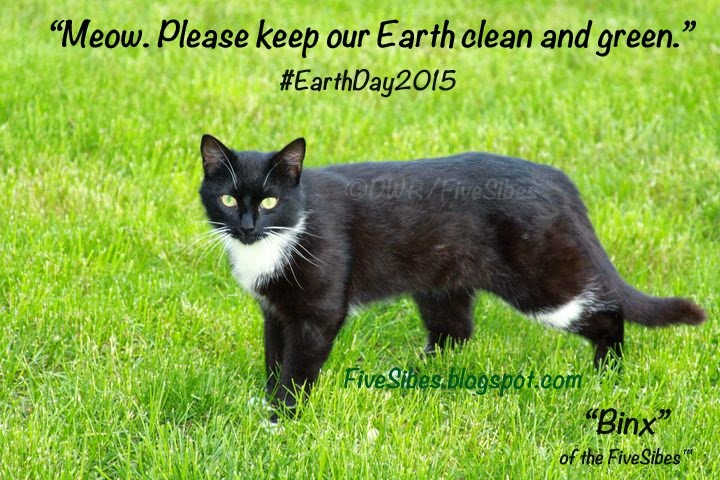 States EarthDay.org, "Earth Day 2015. The year in which economic growth and sustainability join hands. The year in which world leaders finally pass a binding climate change treaty. The year in which citizens and organizations divest from fossil fuels and put their money into renewable energy solutions. These are tough issues but we know what’s at stake is the future of our planet and the survival of life on earth. 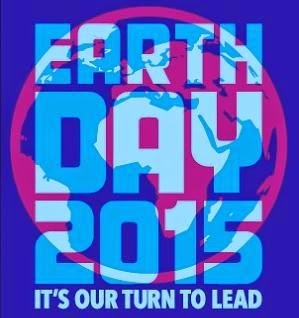 On Earth Day we need you to take a stand so that together, we can show the world a new direction. It’s our turn to lead. So our world leaders can follow by example. In 2015, let's redefine what progress looks like. It’s Our Turn to Lead." Walk your dog whenever possible instead of going by car. Use recycle shopping bags when going grocery shopping for your supplies and food. Feed your pet their food in a stainless steel dish. Make your pet's snacks whenever possible. Recycle pet food containers and cans instead of throwing them in with the trash. 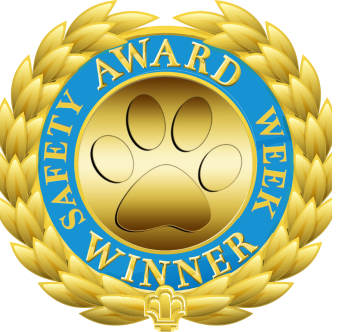 Recycle pet medication containers (check with your vet, pharmacy, and acupuncturist as many happily accept them. 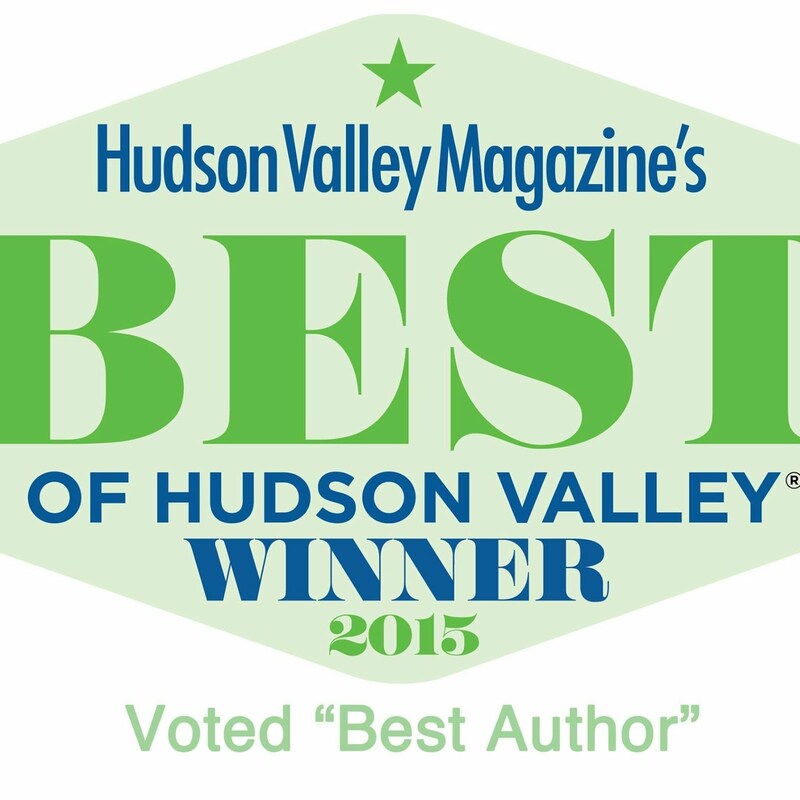 My acupuncturist loves them!). 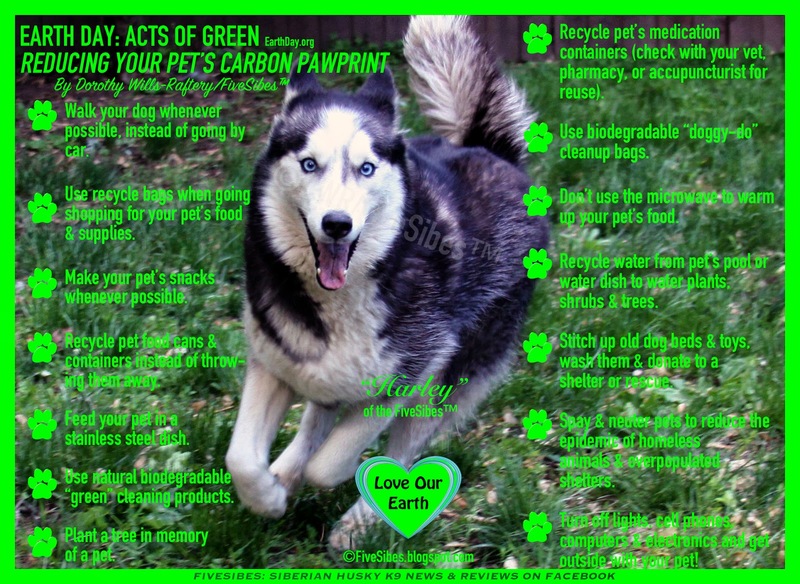 Clean "green" with chemical-free household supplies (we should be anyway for the health and safety of our pets). Don't use the microwave to warm up their food. 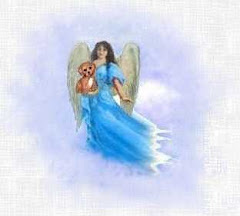 Plant a tree in memory of a pet. 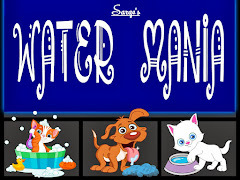 When emptying out a pet pool or water dish, use it to water flowers, shrubs, and trees. Recycle old dog beds, blankets, and toys. Stitch em' up, give them a wash, and donate to shelters. 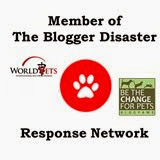 Spay or neuter pets to reduce the epidemic of homeless animals and overpopulated shelters. animals. 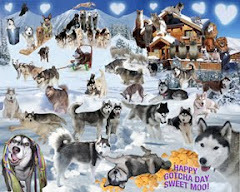 You'll save energy AND have happier furbabies! 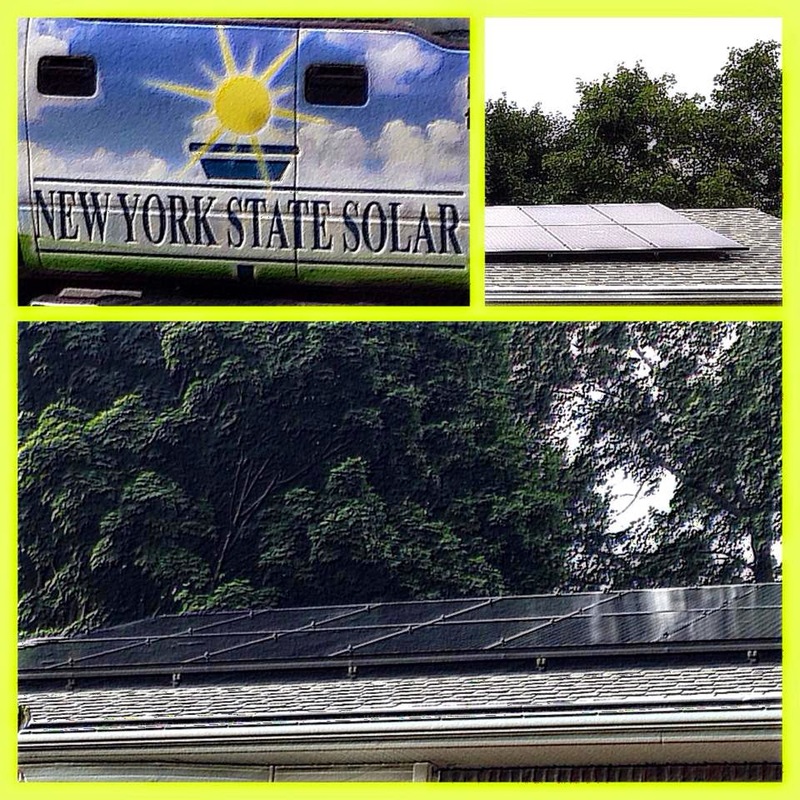 Us Hu-parents have also "taken the lead" by installing solar panels this past year on our home. Do you think you're pretty green? Take the Earth Day Carbon Footprint Quiz. It may surprise you! We're pretty green here with the solar panels, recycling, less driving, and in our pet care...and we still have room for improvement! This stunning time lapse video, "The Untouched" by photographer Shreenivasan Manievannan, is a project that was two-years in the making and contains photos from National and State parks throughout the United States, says Manievannan, "to create awareness about conserving natural resources of our planet, including preserving our skies." Such beauty is a true gift, aren't we all stewards of the Earth and therefore responsible for ensuring the care, safety, and future of such a gift for generations to come? 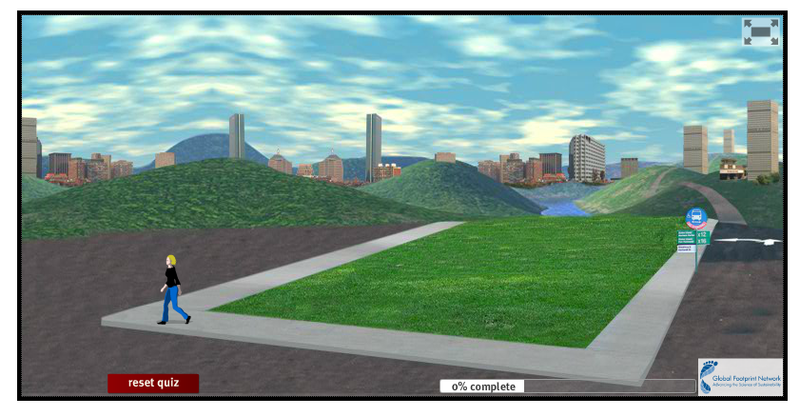 According to EarthDay.org, 1,123,964,427 Acts of Green have been reached! 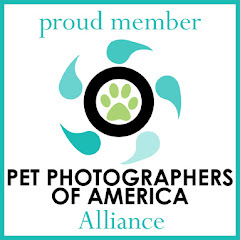 Let's all do our part with our pets to reach 2 Billion! After all, the Earth is everyone's backyard. 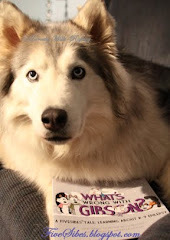 It's Merry Meme Monday and today we are kickstarting the week with this great photo by You Know You Own a Husky, When with the perfect caption by Oh, the Life of Olivia! They both are beautiful furpals and Olivia is a fellow Epi-dog! 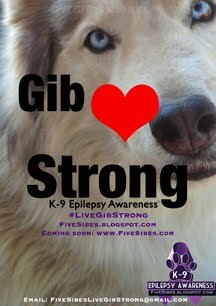 Please stop over and visit their Facebook pages, and be sure to tell them we sent you over! We hope our meme poster brought you a few smiles today and a great start to hopefully a wonderful week! 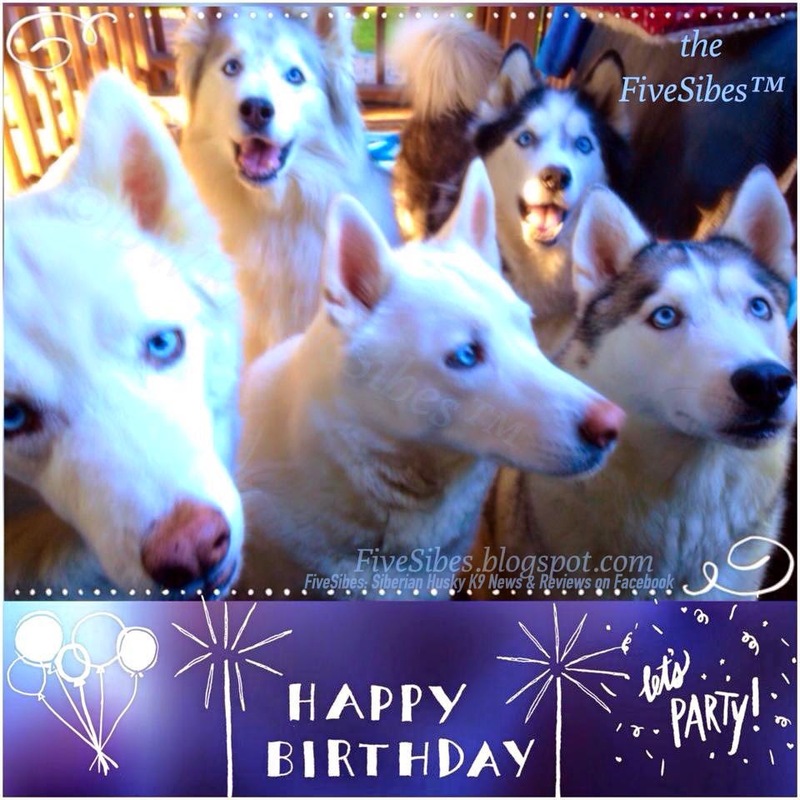 Our FiveSibes™ Merry Meme Caption Contest is periodically hosted over on our FiveSibes: Siberian Husky K9 News & Reviews Facebook page featuring gorgeous Siberian Huskies and clever memes suggested by and voted on our readers. Mondays have you down? 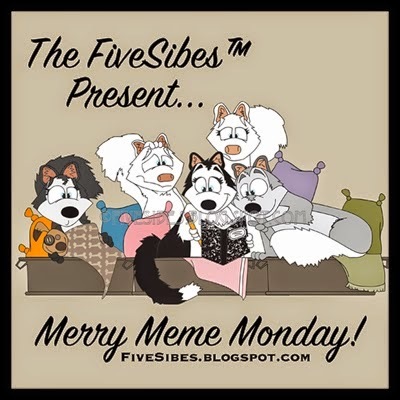 Come join us each week for some Merry Memes and lots of smiles! 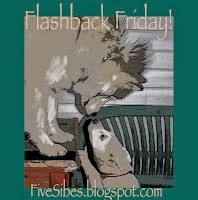 A Circle of (Puppy) Love on a Flashback Friday! No Fools, No Pranks, Just Some Silly Sibes!